Last year I bought a bunch of Bessey clamps from one of the big online retailers and several of the K-body’s came pourly package and thus several clamps came in damaged. I contacted them and they sent some replacement parts. About a month ago I purchased some of the longer Bessey’s K-Bodys from the same online retails and they too came with pour packaging and had some damage. The online retailer offered a small credit if I chose to keep them or I could send them back for replacement. I chose to keep them. Last week I ordered the last of the long clamps (98”/82”) from the same online retailer and they again came in damaged. It was clear these clamps where not in the original factory packaging and had most likely been shipped out once and returned and restocked. I should have just sent them back, but my concern was they would just repackage them and ship them out to another unsuspecting customer. So instead of contacting the online retailer, I contacted BESSEY USA directly. My interest was to determine what the packaging was suppose to look like and to express my concern over the well known online retailer not being able to ship these longer clamps without damage. I didn’t what a credit, I didn’t want to have to return them and have a second pair turn up with the same damage. My email went out at 12:40am and a VP of Marketing responded back by 8:33am that same morning. He clearly was ready to resolve the problem directly even though, it was a problem between me and the online vendor. He asked for alist of the damaged items (jaw covers, rail protector, end protector, end jaw). You just don’t see this kind of customer service these days in cost cutting, so I just wanted to publicly express my appreciation to the folks at BESSEY. For my day job I work for a Software as a Service company that is paving the way in our industry. I work in the support organization doing customer service/relationship management type stuff so I have a bit of a bias toward good customer service. Part of the reason my company is such a leader in our industry though, is because of our dedication to customer service. It still amazes me that so many companies still don’t understand how important customer service is. Wow, Looks like Bessey took care of their customer. To bad their retailer dropped the ball. I have a few Bessey clamps, but no K-Bodys. But the last time I was in Lowe’s I looked at their 10 inche hand screw clamp and was disapointed. They where made in that large eastern country and to my eye did not look any different than one from Harbor Fright other than the Bessey name and a much higher price tag. Granted I did not have the two side by side but I let them pass. But those K-Bodys do look like a fine clamp. Judging by those pics, it looks like you’re a Bessey clamp dealer yourself :) Glad to hear they took care of you. If you haven’t already, I would make it known to the VP of Marketing which retailer you had a bad experience with…they should be held accountable. based on your review, next time I need clamps, I think I will give Bessey a look. If you could tell me which online retailer to avoid, I’d appreciate it. Go Bessy or stay home! You know when you have a valid claim, exposing it on LJ’s seems to have a positive effect on the retailer. 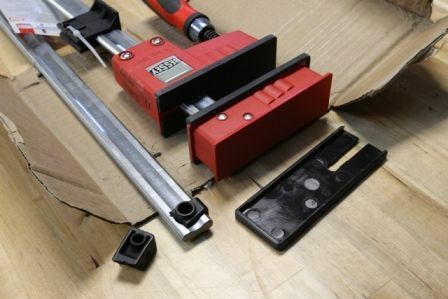 Glad to know Bessey stands behind their product even if the retailer doesn’t seem to. I just kinda scanned this thread, but I didn’t see the name of the “Retailer”.... Would be a big help to the rest of us to know that, if you feel comfortable telling us, Rob. Would be a big help to the rest of us to know that, if you feel comfortable telling us, Rob. I wanted this post to be a positive post about a great company with great customer service and not a negative one. I have another set of clamps 82” pair and 60” pairs coming in tomorrow and Saturday. Bessey indicated they would attempt to address the issue with this company. I will post the results tomorrow (late) and Saturday. The second reason I didn’t post the name was because the online retailer really does a great job with everything else I have bought from them. The problem seems to be exclusively with the 98”, 82” and 50” K-body clamps. These clamps are just a nightmere to try and ship and protect, especially if the original factory packaging has been compromised. The rest of the smaller clamps all come well packed and good condition. If this next batch comes in with better packaging, then my job is done, as my email to Bessey solved the problem. If they come in damaged as usually, I may post the name, but with the understanding that it is just the longer clamps that one should hestiate buying from them. Can I come and live in your shop??? I guess ” You can never have enough clamps” doesn’t apply in your case. Do you detect any jealousy in this post? Is there a local 12 step chapter of Clamps Anonymous in your area? The clamps all came packaged much better. The 82” pair of K-Body’s came in without damage. The packaging was greatly improved. Of the ten 60” K-Body’s that came in, three came in with some damage. See photos. Althought the clamps are still quite usable, there is still obvious damage to the end jaw and end support. This is typical of the damage I have seen. The last set of clamps recieved a few weeks ago, the red end cap had been knocked halfway off. If you are fine with this minimal damage, then order away. I think the retailer has responded to Bessey, but there is clearly more work to do. 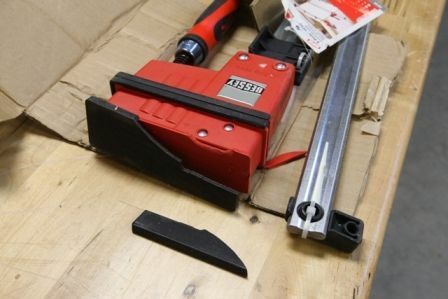 Bessey is the company responsible for making a defect free product and packaging it for safe shipment to the retailer. If it shows up with damage at the retailer, it is the retailers responsibility to address the issue with either the shipper or Bessey. They should not be saleing it to customers. If the packaging that the clamps come in from Bessey is not enough to protect it for further shipment to the customer, then it is the retailers responsibility to improve the packaging so that it can arrive at the customers destination intact. These are difficult/awkward to ship and have a huge potential for damage via the shippers. The clamps I have received over the past year or so have come through both FedEX and UPS and damaged clamps have come via both of them. Clearly, the retailer will take the damaged ones back and give credit or replacement, but when you order them and they are consistently coming in with 20-30 percent of them with damage, it is just a pain knowing that you will have to send some of them back, everytime you order from them. Because I failed to take detailed pictures of the shipping packaging (or lack thereof), there is no “evidence” to send to them. I have no problem purchasing other “normal” items from the retailer, but will in all likelyhood not buy any clamp longer than 31” from this retailer. I will most likely just special order them via the local Woodcraft, so they can deal with the damage before I buy and bring them home. If I am contacted by the retailer, with photos, assuring me that they have completely addressed the packaging, I have no problem going back to them. Considering I have spent over $20K in the past few years via this retailer, I am not just another whiney, nit picky customer who just buys a $10 item that comes in damaged and complains about it over and over again. Yes they do, but I got kicked out. I bought some Bessey pipe clamps from Lowes that had obvious manufacturing problems (I think the pipe clamps are made in China which would explain alot). I Guess I should contact Bessey about them. 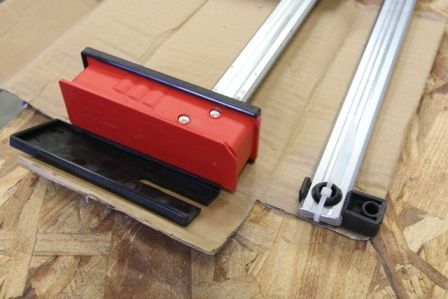 Thanks for posting your experience with Bessey! BTW, The clamp you have with a chipped corner, that will happen anyway the first time you drop one on the floor. And, if you have problems with the black pads falling off (everybody does), just tape them on with double sided carpet tape, the thicker tape works best. I have 6 K-body’s myself and like them alot! I wish I had bought more K-body’s like you did, and less pipe clamps.